Exquisitely rich rhubarb-frangipane for pie is a wonderful substitute instead, or a lemony frangipane-rhubarb-tart is about equal. A rhubarb flavored filling is for you if you like a nut flavored custard filling in a tart combined with a sweet yet sour taste. Dating back to the 17th century and originated by French Chefs, frangipane is a pastry cream filling flavored commonly with almonds and baked. The filling can be baked in a large tart pan, or in any sized pastry shell. More often it is made in tart pans. Frangipane filling is poured over a sweet pastry crust. You can make a regular pie crust by hand or use a store bought crust. You may use dough that is purchased in a grocery store and spread it in a pan once thawed to make a shortbread crust. The recipe can be as simplified as you like. 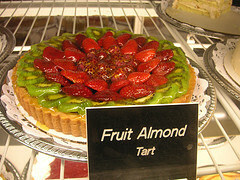 A fruit sauce or compote covers the surface of the rhubarb-frangipane filling or the top of the pastry crust. Which-ever order you think best is ok. Fruits and berries can be in raw fresh form as garnish for the top, or can consist of a compote to be poured if desired. Many fruits used raw are large fruits that can be cut into the same thin shapes and spread over the frangipane in a pretty pattern. Fruit can be added on top of the whole dessert and baked with a whipped cream added when served or otherwise left plain. It all depends what you would like the end result to look like. The baking of this tart results in a crusty exterior, and a very rich custard filling on the inside. As an alternative to almonds, you may use any kind of nut flavoring you like. Hazlenuts are frequently used in place of the almonds. The pastry, nuts and custard fillings go together equally well when combined, and the fruit is an added bonus. Incidentally, these recipes are considered the "sweet" frangipane dishes. "Savory" frangipane dishes involve cooking with cheese and onions and other combinations of flavors. The recipes may seem long, but they aren't really. They have three sections each to make. Experiment with the creamy sweet and tart taste of rhubarb-frangipane for now, and just have fun with it. Mix and simmer over medium heat until rhubarb softens and mixture has thickened. Remove from heat and chill. You may use your own pie-crust recipe to fill a 10 "pan. You may use a ready made pie crust from your grocery store. If you would like to try a shortbread crust, this is a good recipe. Gently mix ingredients until a soft dough forms. Form into a ball, and roll out onto a floured work surface. Roll the dough to cover your pan with an inch to spare all the way around. Place parchment in your pan so that you can lift it out after it is baked. Press the dough into your tart pan and chill. Put the almonds through a processor until of a medium fine texture. Slowly add the rest of the ingredients and process until mixed. Put the filling into your tart shell, leaving some space at the top. Bake at 350F for 25 minutes. Filling should be golden and firm. Lift the tart shell gently from the pan and place on a plate or flat surface. Spread the rhubarb sauce gently and evenly over the baked tart. Garnish your rhubarb-frangipane if desired with slivers of almonds, and serve in wedges topped with whipped cream. On medium heat, simmer the above ingredients until rhubarb is tender, and mixture thickens. Refrigerate until well chilled. Process the above ingredients just on pulse a little at a time until coarse in texture. Transfer to a bowl and add milk by the spoonfuls until the dough holds and forms a ball. Wrap in plastic and chill for 40 minutes. After 40 minutes, turn dough onto a floured surface and roll to fit an 8" tart pan fitted with parchment paper. This is so you can lift the tart out of the pan later. Leave some overlap so you can crimp the edges. Make some holes with a fork in the bottom of the crust and bake in a 375F oven for 12 minutes. Let cool. Melt the butter in a saucepan on low heat and remove. Add the lemon juice and sugar and beat with mixer. Add the eggs slowly and beat until well combined. Spread the rhubarb sauce over the tart pastry, and gently pour the frangipane lemon filling over top of the sauce. Bake 30 minutes at 375F or until filling is golden. Let cool very well before removing from tart pan. Garnish if desired with almonds and lemon zest. Return To Savor The Rhubarb Home Page.